More photos about this event can be found on Azrael Coladilla's site. I was fortunate to have been invited to watch the screening of the 10 film finalists in the Short Film category of the 3rd Philippine Graphic Fiction Awards. It was held in U-View theater of Fully Booked bookstore at The Fort, Taguig City on February 23, 2010. The screening was sponsored by TGIFriday’s and Bo’s Coffee. Arch. 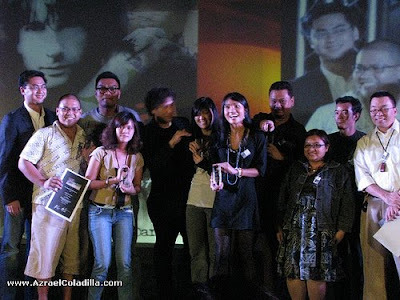 Jaime Daez, owner of Fully Booked bookstore and Neil Gaiman handed out the awards on March 17, 2010, 7:00PM at the Rockwell Tent in Makati City. Unfortunately, there was no 1st Place Winner being awarded for the Short Film category as no entry met the minimum score for the prize. Would you want to wake up from a perfect dream? By sending the Filipino land squatters to the planet Mars the Filipinos would not only be seen as heroes of the world, they would become saviors of mankind. A romantic comedy where Pinoy family values and Philippine Lower Mythology combine! The search for love and meaning. A young woman looks for her missing wallet in a mysterious lost and found kiosk where she also finds things she thought she’d never see again. A well-rounded fable with a bounce of whimsy. The film is a meditation on the nature of creative production, as a form of covetous voyeurism, in a third world setting. Takot Ako is the story of a girl who finds out too late the true meaning of ghost hunting.